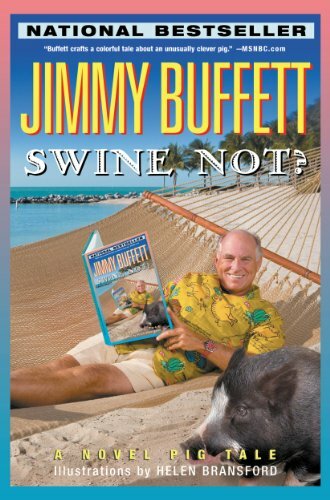 It’s real original yacht rock time over here, folks: Belly up to the groaning board and get ready to pig out, because the buffet we’ve got ready for you, courtesy of Jimmy Buffett, is called Swine Not! 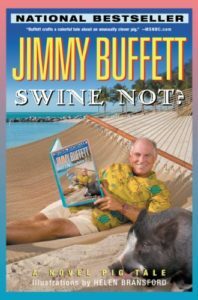 Buffett hams it up as our eyes glaze over, and the porcine puns have, lamentably, just begun. It’s a deeply inoffensive text, but Clsn spends the entire time peevish and grumpy, so that’s fun, and we completely forgot to mention during the episode that there’s a very, very real possibility that, in the world of Swine Not, Noah’s Ark was a real thing. (It’s true! Page 34!) If that’s not enough, J. springs the biggest surprise the show has ever seen! If you’re pining for some portions of porky plotting, hungry for some ungulates, or just in a mood to hear a LOT about a young boy’s soccer season(s),adjust your chef’s hat and get ready for a book that’s nothing but … truffle. BONUS TEXT-ONLY SHOW SEGMENT! Imagine you’re hearing the song “Rippin’ It Off” right now. Uh, okay, what is this book-like object about some pig trying to find its way in New York City, ah, shall we say, reminiscent of? Yup, that’s right: we’ve got a little bit of Charlotte’s Web, a tiny bit of Babe: Pig in the City, and just enough of both to make us wish we were encountering those. And not, and I repeat, NOT, this.